One of the recently added flavours is our Peanut Butter. 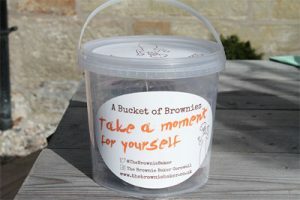 We also try to offer our customers a range of packages they can buy our Brownies in and from feedback this summer we have produced the NEW Brownie Party Bucket. 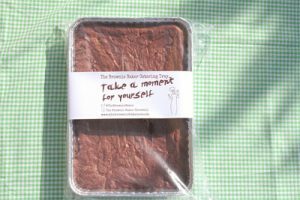 This is an ideal way to take our Brownies to your friends and share them. 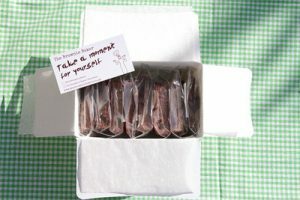 If you can think of a great way to share your Brownies do let us know. The Brownie Baker Bar is the equivalent to 2 brownies in a wrapped package – ideal for an individual coffee time snack. 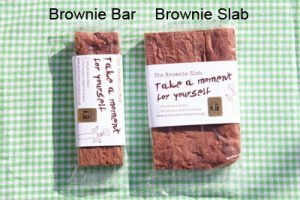 The Brownie Slab is the equivalent to 4 brownies and is ideal for two people to share on a coffee break or if you’re feeling very generous 4 to share!. The Brownie Baker Gift Box contains 8 individually wrapped brownies in a lovely plain white card box. The gift box makes a wonderful present for friends and family for birthdays, Christmas, a thank you or as a different corporate gift to clients to make your company stand out. The NEW Brownie Baker Party Bucket contains 12 individually wrapped brownies in a sturdy plastic bucket. This is a great present to take to an evening with friends and makes a smashing present for the kids as they can then use the bucket to make sand-castles! The Brownie Baker Hamper comes in two sizes containing either 16 or 24 individually wrapped brownies. The hampers are a rustic cardboard with shredded recycled cardboard padding to stop your brownies from being damaged. The hampers make a great present for people that really love their chocolate! The Brownie Baker Tray is a simple aluminium tray containing the equivalent of 16 non-cut brownies in a simple polythene sleeve. The tray is ideal if you are going to have a large party or office celebration where you will cut and place the brownies on a plate for your guests. 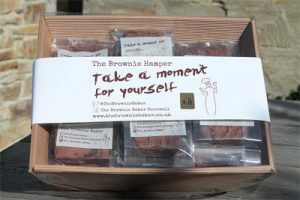 Our Brownie Baker Hampers make lovely gifts - why not buy one today?